↑ Neoteny. (2012). Your dictionary. Retrieved September 19, 2012, from link. Pronunciation is shown as (nēŏtˈnē) and in IPA notation it is /niːˈɒtni/ as can be inferred from the Pronunciation Key. ↑ Neoteny. (2012). Oxford Dictionaries. Retrieved September 19, 2012, from link. Pronunciation is shown as /nēˈätn-ē/ and was changed to IPA notation using Help:IPA/English and the vowels of fleece, lot, and happy. ↑ Volkenstein, M. V. 1994. Physical Approaches to Biological Evolution. Springer-Verlag: Berlin, . ↑ Ridley, Mark (1985). Evolution. Blackwell. http://www.blackwellpublishing.com/ridley/a-z/Neoteny.asp. ↑ Whiteman, H.H. (1994). "Evolution of facultative paedomorphosis". Quarterly Review of Biology খণ্ড 69: 205–221. doi:10.1086/418540. ↑ Ginetsinskaya, T.A. Trematodes, Their Life Cycles, Biology and Evolution. Leningrad, USSR: Nauka 1968. Translated in 1988, . ↑ Shea, Brian T. (1989). 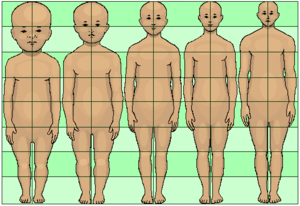 "Heterochrony in human evolution: The case for neoteny reconsidered". American Journal of Physical Anthropology খণ্ড 32 (S10): 69–101. doi:10.1002/ajpa.1330320505. http://onlinelibrary.wiley.com/doi/10.1002/ajpa.1330320505/pdf. ↑ Gould, S.J. A Biological Homage to Mickey Mouse. ↑ Thiessen, D.D. (1997). Bittersweet destiny: the stormy evolution of human behavior. Transaction Publishers, N.J.
↑ Gould, S.J. (1996). The mismeasure of man. W.W. Norton and Company, N.Y.
↑ Jones, D. (1995). "Sexual selection, physical attractiveness, and facial neoteny: Cross-cultural evidence and implications [and comments and reply]". Current Anthropology খণ্ড 36 (5): 723–748. doi:10.1086/204427.